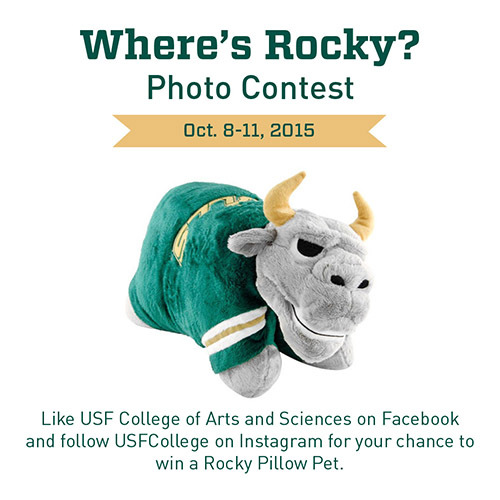 TAMPA, Fla. -- Followers of the USF College of Arts and Sciences Facebook page and Instagram account will have a chance to win a Rocky Pillow Pet by participating in the popular “Where’s Rocky?” photo contest. Here’s how it works: Beginning Oct. 8 at noon, pictures of Rocky at a campus location will be posted on Facebook and Instagram. To participate, contestants will gain points by commenting on the pictures with Rocky’s correct location. Contestants who comment with the correct location will be awarded one point. However, the first person to comment with the correct location will gain two points. Contestants can earn additional points by commenting on both the Instagram and Facebook posts, which will contain different photos. The contest will end on Oct. 11, and the person who receives the most points by that date will win the Pillow Pet. In the event of a tie, a winner will be selected at random from among the contestants with the most points.